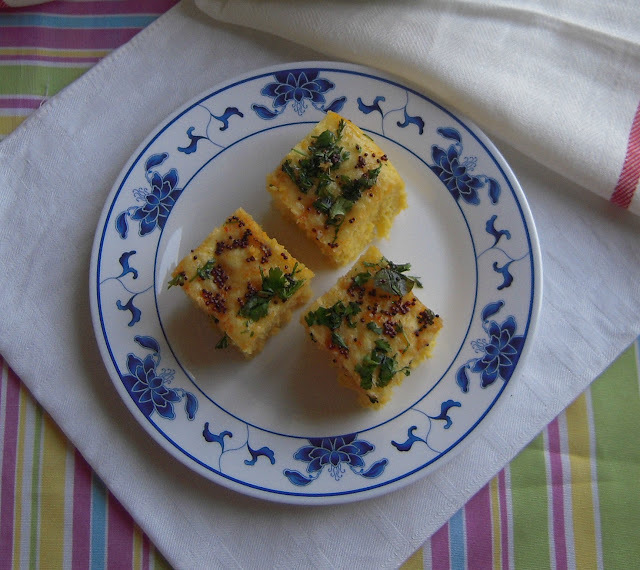 I absolutely love Khaman Dhokla. Most of the time I make it with ready to use Dhokla mix. They are really a great time saver. But there are times when I run out of these instant packs. It was one of those occasions when I decided to make it from scratch. I have tried a lot of different recipes and I have finally zeroed on this one. It is really a simple and quick recipe. Khaman Dhokla is a Gujarati snack but it popular through out India. The best thing about it is steamed and hence, is healthy and low calorie. So, even if your new year resolution says to stay away from fast food, you can relish this quick snack. 1. In a large bowl add the chickpea flour, salt, sugar, oil and lemon juice. Stir and add water little by little to make a smooth thin batter (a little thinner than cake batter). 2. Place a large pan on heat. Add about a cup of water and a ring on which to place the pan for steaming Dhokla. 3. Grease a 8" sandwich cake tin with oil. Keep aside. Add Eno fruit salt to the batter and whisk lightly. The batter will increase in volume. Pour the batter in the prepared tin and place it in the pan of boiling water. Cover and steam for 12-15 minutes on medium heat. 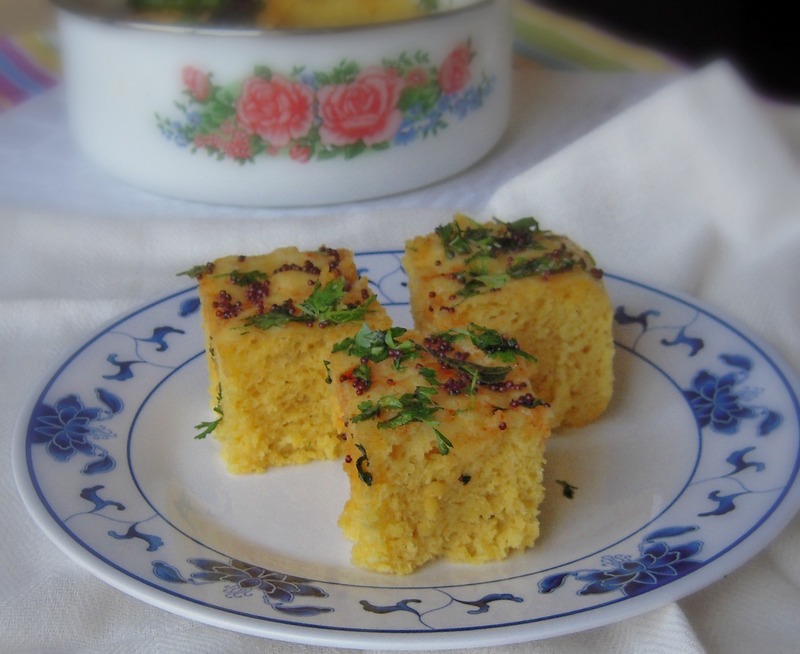 When done, a skewer inserted in the Dhokla will come out clean. Take it off heat and let it cool down. 4. Heat the oil for tempering. When hot, add the mustard seeds and curry leaves. When it splutters add the green chili and red chili powder. Take it off gas. Set aside. 5. Mix water, sugar and lemon juice. Add it to the tempering mixture. 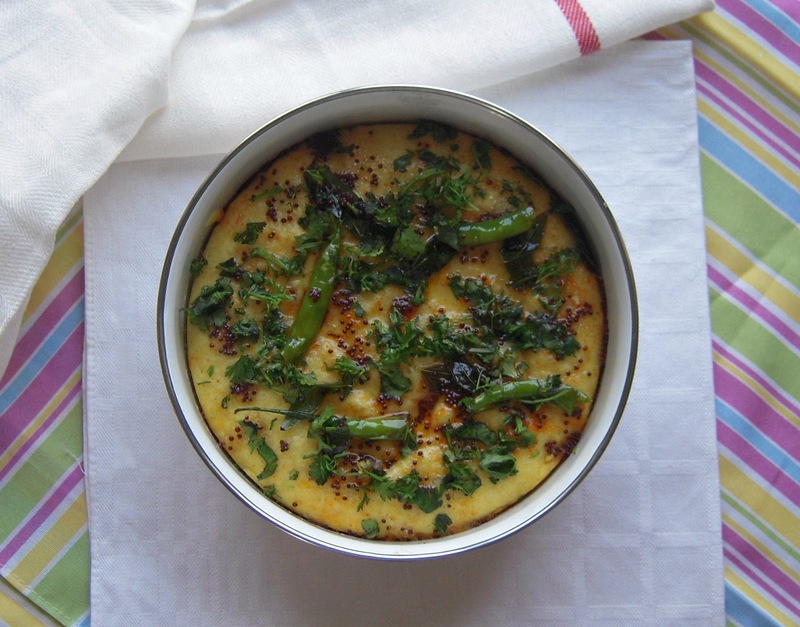 Spoon it over the cooled Dhokla Sprinkle chopped coriander leaves. Serve with green chutney, sweet dates and tamarind chutney or tomato ketchup! Enjoy! Note: You can also add some sesame seeds to the tempering and fresh shredded coconut for garnishing. I skipped it as I didn't have it at hand. One of my all time fav snack. Looks yumm! Love that tadka on top jyoti!! !So Inviting and seriously tempting!!! Fantastic snacks, makes me drool. Thanks Beena for letting me know.. This looks really good, and it is gluten free which is perfect for my family. I'm going to try it later today. Can you answer one question -- in step 5 it says to mix water, sugar, and lemon juice. How much lemon juice is used in this step? Thanks in advance! This looks really good, and it is gluten free which is perfect for my family. I'm going to make it later today. Can you answer one question? In step 5 it says to mix water, sugar, and lemon juice. How much lemon juice is used in this step? Thanks in advance! 3 tbsp lemon juice as specified in the ingredients.